Qualified Small Employer Health Reimbursement Arrangements (QSEHRA) vs. SHOP Plans. Which is right for the Household Employer? 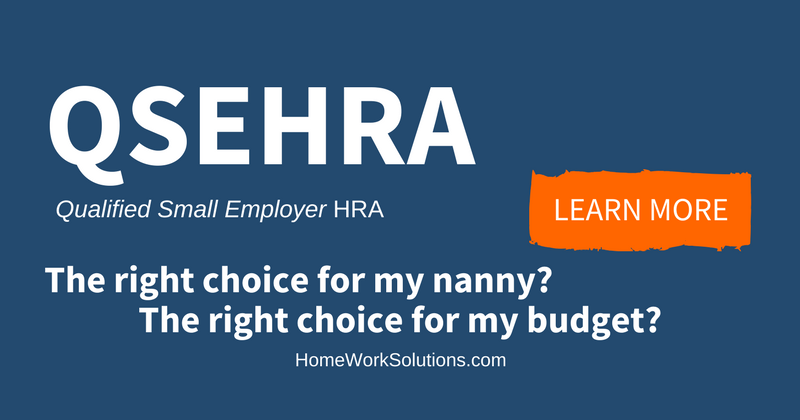 Home / Our Blog / Qualified Small Employer Health Reimbursement Arrangements (QSEHRA) vs. SHOP Plans. Which is right for the Household Employer? Prior to the enactment of Obamacare ( Patient Protection and Affordable Care Act), household employers gave little thought to cost and regulation when it came to subsidizing a household employee's health insurance costs. The employee and employer simply negotiated a tax free reimbursement contribution, the employee purchased insurance, and the entire transaction took place under the government radar, perfectly legally. With Obamacare came not just regulation of what must be included in a medical insurance plan, but also tax subsidies that were intended to help make these qualified plans affordable to low wage workers. The tax subsidies triggered new regulation, because the government didn't want to be subsidizing the cost of insurance that was already being partly or fully subsidized by an employer. The old Health Reimbursement Arrangements (HRA's) were first on the chopping block. Today household employers have two options to legally subsidize or pay for employee health care plans. If you have 2 or more employees, you can purchase health insurance for your household employees on the SHOP, or Small Business Health Options Program, marketplace. Alternately starting in 2017 you can establish a QSEHRA (Qualified Small Employer Health Reimbursement Arrangement). The key to the former is the employer pays for the cost of insurance, a cost that is steadily rising and beyond their control. The key to the later is establishment of a QSEHRA Plan, and W-2 reporting of the employer healthcare reimbursement to prohibit double dipping. A SHOP benefit offering is a one-size-fits-all benefit - the employer chooses the plan for the employee, largely based on cost, and the plan coverage and benefits are predetermined for the employee by that selection. A QSEHRA on the other hand can be more attractive. The employer can define their maximum cost in their plan documents, the employee can choose their own insurance on the personal health insurance marketplace, and perhaps most attractive to the employee they can keep their plan as they move jobs.